From lighting, music selection,equipment, and personnel. Everything about my company is quality. I am proud of every facet of my business. What this means to my clients is value and the peace of mind that their entertainment will not be a problem. I put your concerns first in every facet of your event. I have a genuine desire to make your affair a wonderful experience. Proper attire, an enthusiastic attitude, extensive music knowledge, and a comprehensive skill in event coordination make our entertainers second to none. I have earned a reputation of exceeding our customers needs. I have performed everywhere. From the finest ballrooms, to your neighbor's backyard. No matter what size or style of event, I promise you on time, professional service with equipment and effects that keep us on the leading edge. 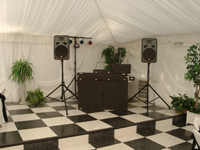 We guarantee on-time professional mobile DJ/Karaoke services at a fair & reasonable price period!